The Florida panther is one of the earth's most endangered animals. An estimated 160 to 180 animals remain in the wild. The only breeding population appears to be in South Florida. The Florida panther also is an official state co-mammal, sharing this official distinction with the manatee. The Florida panther, Puma concolor coryi, is a subspecies of what is called a mountain lion, cougar or puma in other parts of the country. And although cougar attacks have occurred in western states, there has never been a recorded attack in Florida. The Florida cat is actually misnamed. Typically, the name panther is assigned only to black felines, yet Florida's cat, like other cougars, is tan-colored. Why the discrepancy? One theory suggests that early settlers who sighted it at night thought it was black. Or the name could be derived from the Greek name for leopard since the cat's young are spotted and the adults lack a mane. Correct or not, panther is the accepted name for Florida's feline. Ironically, a little over 200 ears ago, cougars were one of the most broadly distributed animals in the Western Hemisphere. They ranged from the tip of South America to Canada and were found in every region of the United States. Today, the Florida panther is the only cougar which survives east of the Mississippi. The rest were hunted to extinction. More Important: Cattle or Panthers? 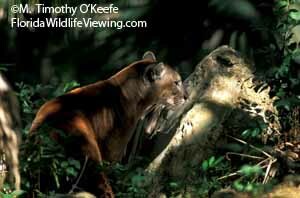 In Florida, as well as the rest of the country, the panther was aggressively hunted for decades because of the belief that cougars attacked livestock. Although generally not recognized, Florida has always been one of the nation's top cattle producers. To encourage elimination of the panther, a $5 bounty was placed on the animals in the late 1800s. Cattle again impacted the panther's well being in the 1930s and 40s when white-tailed deer were slaughtered by the thousands in an attempt to eliminate the tick that causes Texas cattle fever. That severely reduced the panther's food supply. Then, large-scale clearing of wilderness areas for human development further reduced their habitat and their number. Unfortunately, not even the remote Everglades is a safe haven for the big cats. A dead panther once was found with levels of mercury so high they would have been fatal for a human.